This post was submitted by Marcie M. Dela Cruz for Children’s Miracle Network Hospitals through childrensmiraclenetworkhospitals.org/guest-post. It’s just before 5:30 a.m. and I’ve already hit the snooze button once on my phone. I can hear baby gates opening, pitter-patter on our wood floors and the air vent in the hall bathroom on. It’s my second alarm that I can’t push a snooze button on. My husband Ray has already started waking the boys up one-by-one to go use the bathroom; the first task of many before we head out the door in an hour. I lay in bed until exactly 5:30 before I join in on the morning fun. By this time, the last of the “baby” boys is using the bathroom and Makaio is up folding all their blankets. 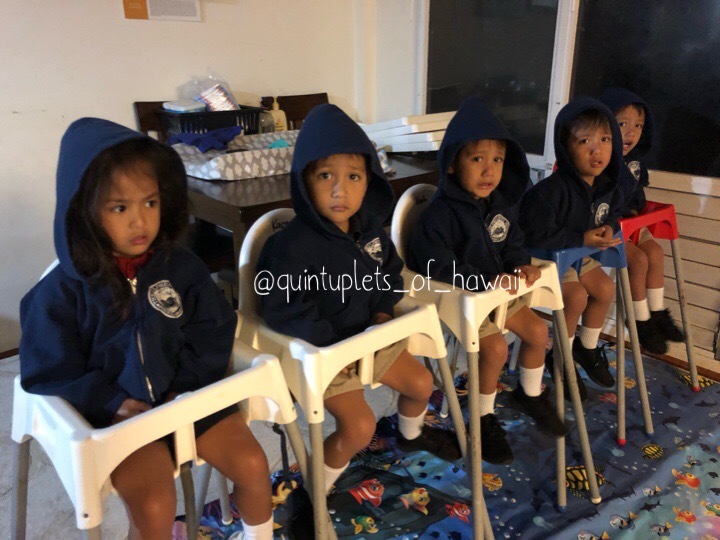 Once the boys are all dressed, it’s time to wake up Kamali’i. At this point, it’s about 5:45 a.m., Makaio is FINALLY starting to get ready and Ray is putting together a quick breakfast which is usually a combination of pancakes (frozen ones from Wal Mart), Waffles, Bananas or Yogurt and Cheerios. Whatever is quick and easy works. To keep things moving and to avoid the “Daddy, I dropped my spoon” one million times, he feeds them. We deal with dropped spoons, spilled milk and knocked over bowls during dinner (eek!). While they’re being fed, I’m putting on name tags, spraying the boys’ hair with water to nicely brush out the effects of bed-head, and brushing Kamali’i’s long locks. By now it’s about 6:00 a.m. and I need to get ready for work. By the time I fix our bed and get myself ready for the day, Ray has finished feeding the kiddos and brushed all their teeth (Lol, I just googled and found out toddlers have 20 teeth by this time…that’s a hundred teeth to brush!) If he’s not done with the hundred pearly whites, I join in while I’m making sure Makaio is brushing his. Once everything is cleaned and put away, we’re ready to hit the road and its somewhere around 6:30 a.m.
Now it’s time to re-tie shoe laces that miraculously untie themselves, negotiate who gets to turn off the lights, and somehow get them all out of the house standing by the gate ready to load up into the van. At this point they’re WIDE AWAKE with more energy than you can imagine. I try my best to keep them quiet, but I’m unsuccessful most of the time so if any of our neighbors are reading this, I’m sorry! In the Van, Ray and I are both buckling up kids who wiggle like they really do have ants in their pants. Makaio is trying to help, but is usually unsuccessful. Once everyone is safe and secured, I jump into my car and follow the giant Van down the street to school. We reach the school and then instantly become entertainment for all who’s there to witness our arrival. Making sure everyone gets out of the van safely and stays near us without getting their fingers smashed before we have to cross the street is definitely a sight to be seen. What makes it better, is if it’s raining. On those days, everyone wants to hold the umbrella so all you see is an umbrella with 12 feet below it crossing the street. We’re in the school now and the babies all have to pet the sheep. There’s a statue with Jesus and two sheep as they enter the school and it’s become part of their routine to pet the sheep before going to their class. Next, is goodbye to Makaio. He’s a big kid, so he goes to a different area in the school. 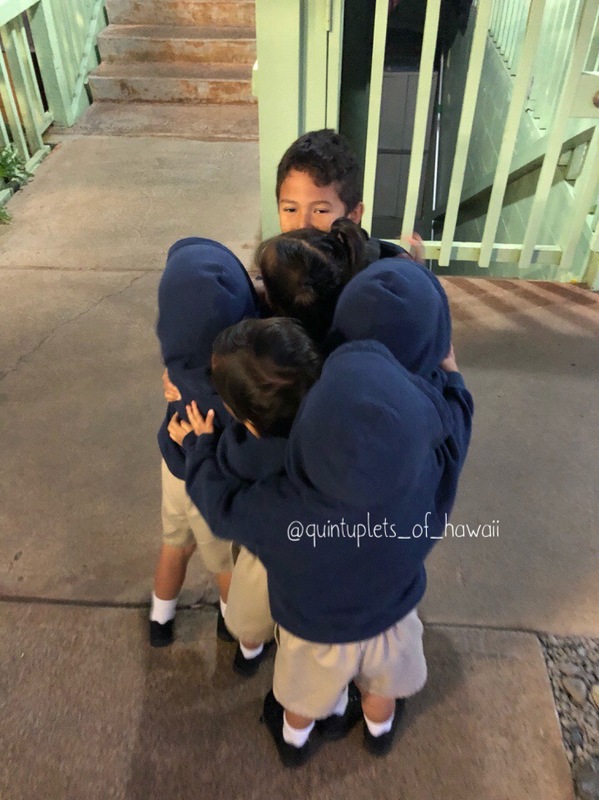 Hugs, kisses and “Bye, Makaio” (times five). Getting the babies to their area and saying goodbye to each of them takes about 10 minutes. Each wants a kiss, each wants a hug and sometimes it’s repeated multiple times. As we’re leaving the school, I give my husband a kiss and we say our goodbyes as I head into town to get my work day started. Our life may seem crazy to most, but I wouldn’t have it any other way. I’ve said this before and I’ll say it over and over again. 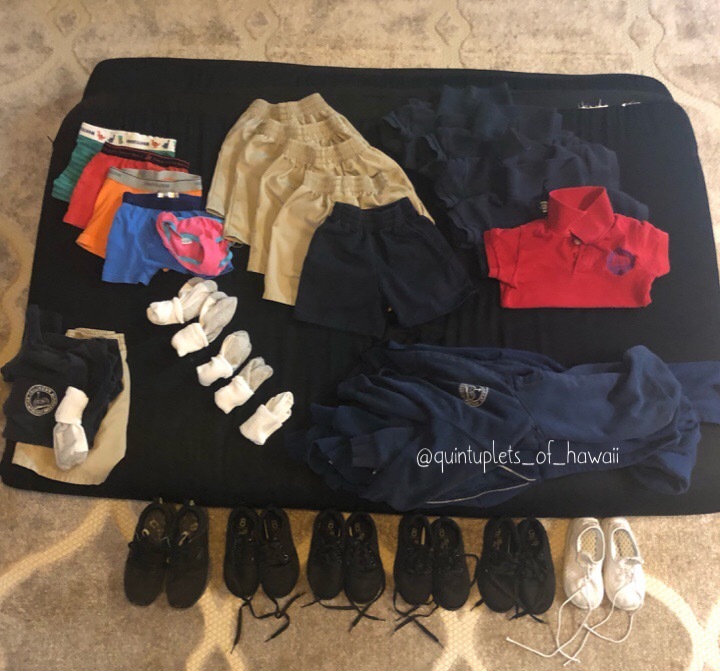 Life with 6 young kids is overwhelming, but I’m somehow not overwhelmed. Writing this, it seems like A LOT. But really, we’re a well-oiled machine. Ray and I are great partners. Once we figure out what works, we stick to it. Establishing routines has been what’s made our life with quintuplets “easy”. We never complain, we just do. Good Morning from my Ohana to yours! Getting a quick cartoon in before the day starts. Their very first day of school. Next post: Ace Shootout Donates Back!